This factory was built in about 1900 and appears on maps simply as “Bedstead Works” facing the workhouse that evolved into City Hospital. The big sign with just a few letters hanging off suggests it’s called Western House; a tiny sign above the door says it’s the Holdfast Works; trade directories from 1900 point to it as Hoyland and Smith’s newly-built Soho Works. Those maps and directories point to a huge industry for iron and brass bedsteads in Birmingham at the time. These were not just for local needs, for instance Hoyland and Smith were just one firm exporting bedsteads to Western Australia. 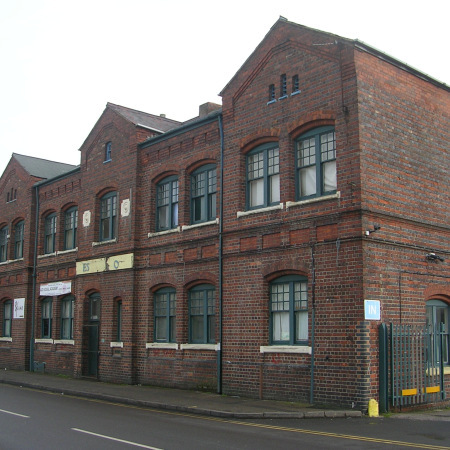 Demand for brum beds clearly declined over time and new businesses took over the factory. It’s not a high class building but it has some nice touches. There are three bays that project forward. Each bay has three windows. The top part of most windows are made of 3×3 small panes of glass. Re-development of this side of Western Road was announced this week. Also not far from Icknield port loop – fascinating part fo the city due for big changes. One day that hospital might get finished!